Cafe Calamari – Located a few miles west of downtown Lake Geneva in Williams Bay, Cafe Calamari is widely regarded as one of the area’s top fine dining destinations. Cafe Calamari boasts multiple bars within the restaurant, and has a diverse menu with something for everyone on it. You can also visit Harpoon Willies Pub & Eatery for a more laid back atmosphere. Poons (as the locals call it) is located in the same building as Cafe Calamari. Pier 290 – Also located in Williams Bay, Pier 290 has quickly become a hot spot for fine dining and boaters. They have parking at their pier, and docking service available. You can find a large, diverse menu there, and often times live music. Dip your feet in the sand and enjoy dinner and drinks while overlooking beautiful Williams Bay. 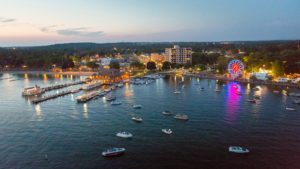 Geneva ChopHouse – When coming to Lake Geneva, you cannot go wrong with a stay at the Grand Geneva. The Geneva ChopHouse is located in the main resort, and is built with the steak lover in mind. the ChopHouse is open for brunch and dinner, and you can visit their website for more information. Next Door Pub – Just take my word for this one. I will bare you the details of describing their delicious thin crust pizza to you, just make sure that next time you are in town, you hit up the Pub for a pizza. You can thank me later! Also, they have great food all around. Pretty much everything on their menu is delicious, and they are kid friendly so bring the whole crew. Harpoon Willies Pub & Eatery – Yes, I mention Poons from above as they are the little brother to Cafe Calamari. Poons is a pub, with a great selection of food and drinks, and a great view of Williams Bay. Not to be overlooked, Harpoons has a great pizza. They have both simple and exotic types of pies, so you will definitely find something you like. Ginos East – Located right in the heart of downtown LG, Ginos brings their tradition rich chain to the city of Lake Geneva. It is no secret that come summer, 90% of the people in and around the area are from Chicago, so I guess this is a great way to make them feel right at home! We all know Chicago is known for it pizza, and Ginos will definitely not disappoint. Aside from the fine dining and pizza options listed above, the area has a ton of other great places to grab a bite. You will find all of the fast food joints you could want, plus other places like Claws (Beefs, burgers, hot Dogs etc..), Daddy Maxwells, Rosatis, Riga-Tonys, and many other places like that where you can get some good grub, then wash it all down with some ice cream! Thanks for checking this out, we hope it helped!